Senator Bill Nelson had some good news for people impacted by the ongoing water crisis. He says the Federal Government now has the money to speed up repairs to the Herbert Hoover Dike by three years. The project will now be complete by 2022. The dike surrounds Lake Okeechobee protecting communities around it. Nelson, who is up for reelection, made the announcement in Belle Glade as he made three stops across the state. "This quicker completion of the dike will help with the algae because they're worried about the dike breaking and now they can hold more water in the lake," said Nelson. Nelson also made stops in Fort Myers and Stuart. Two communities dealing with algae blooms in their waterways with the U.S. Army Corps of Engineers discharging water from Lake Okeechobee. At a packed house at Stuart City Hall, many hammered the Senator on this issue. "Rashes, irritation," said Robert Lord Jr. at Martin Health System. "Getting worse all the time," said Mark Perry with Florida's Oceanographic Society. "We talk a lot about shared adversity, but we get the brunt of it on the east and west coast," said Kim Streiber. 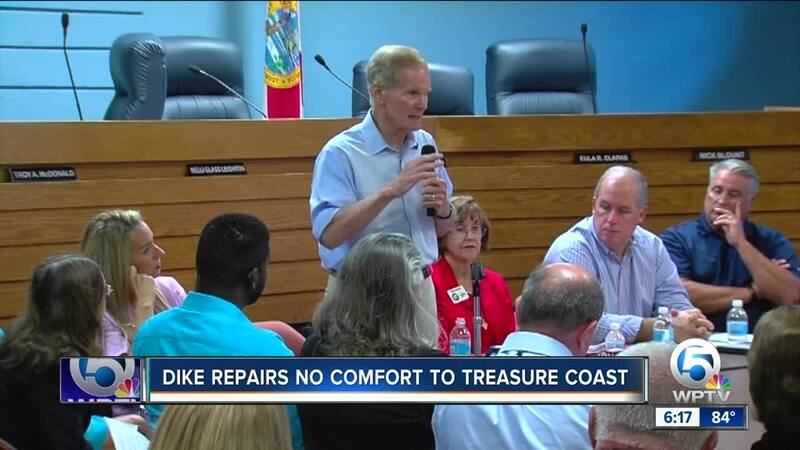 Senator Bill Nelson says he is working on getting projects done south of the Lake, including the EAA Reservoir which many say will significantly reduce harmful discharges. Many are asking for action now. "I would like to see them hold the water back a little bit longer. Lake is 90 percent covered in algae. I hate to seem them open the locks," said Streiber. The Corps plans to resume Lake Okeechobee discharges Monday after a nine-day break that started last weekend.